Visit Talley Vineyards on Fridays, Saturdays, and Sundays during November to experience their special Pinot Noir Tasting. 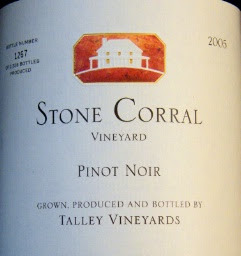 According to the Talley Vineyards' web site, "There is just a limited amount of time each year that we have all of our pinot noir wines available for tasting, and the time is now!" The Special Tasting is $15/per guest ($10 for members) and includes the following 2006 wines: Estate Pinot Noir, Edna Valley Pinot Noir, Stone Corral Vineyard Pinot Noir, Rincon Vineyard Pinot Noir, and Rosemary's Vineyard Pinot Noir. Our daily tasting is also available: $6/per guest (complimentary for members).